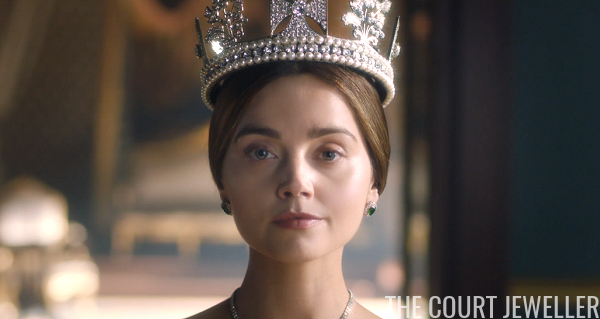 This Sunday, the first episode of the latest season of Victoria aired here in the States on PBS. 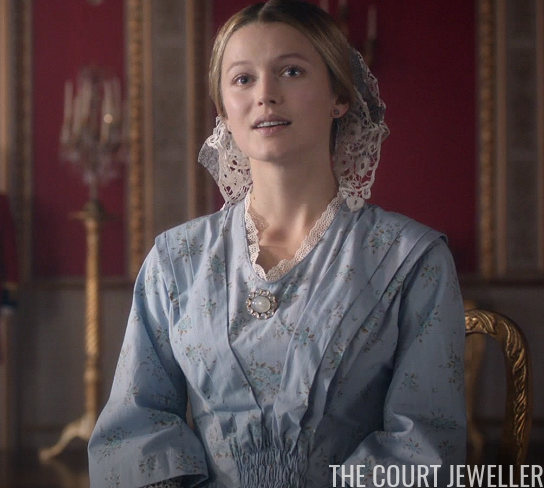 Today, we've got a look at the jewels from the premiere. 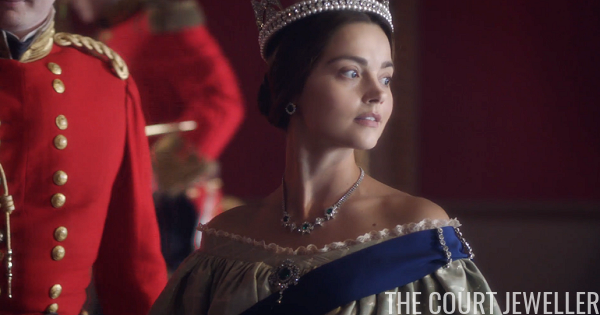 So here's an incredibly quick rundown of the plot (such as it is) of this episode: it's 1848, Queen Victoria is pregnant with her sixth child (Princess Louise), and King Louis-Philippe of the French has just been knocked off his throne. He arrives to seek exile in England just as the Chartists are organizing a petition, making life complicated for Victoria and Albert and the prime minister (Lord John Russell) and the foreign secretary (Lord Palmerston). 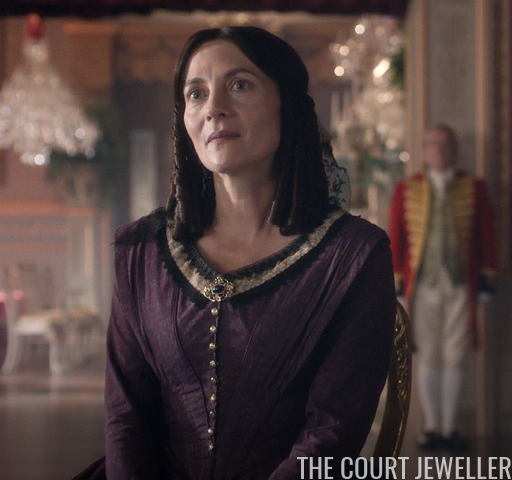 There's also a new (fictional) Mistress of the Robes at court, the Duchess of Monmouth. Oh, and Victoria's (real) half-sister, Princess Feodora of Leiningen, although the series makes it seem like the two barely know each other, when the real sisters corresponded throughout their lives. As far as the jewels go, we've got some interesting pieces. 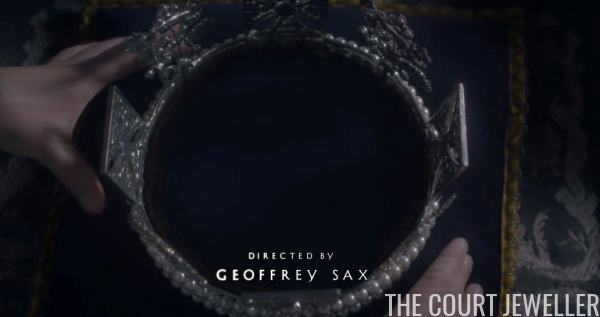 One of the first jewelry shots is this overhead view of the replica of the George IV Diamond Diadem. Note that the production version appears to have been made as a circle rather than a slight oval -- no wonder it doesn't fit very well on a human head! 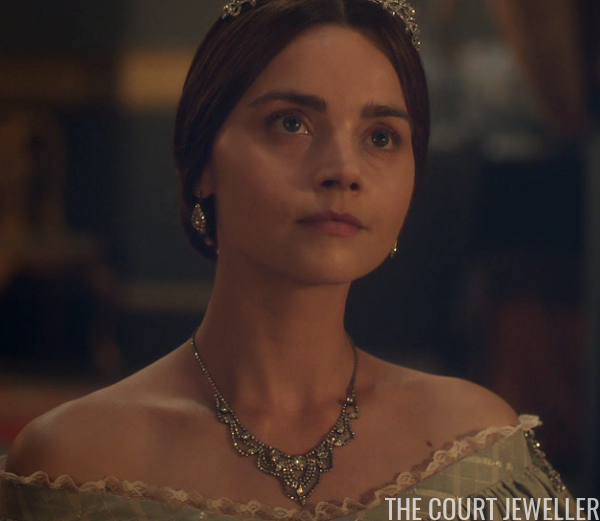 We see Victoria wearing the diadem at court with an invented suite of diamond and emerald jewelry. Based on promotional photos, it looks like this suite was made to "coordinate" with the production's most successful replica, the Diamond and Emerald Tiara (which does not appear in this episode, sadly). 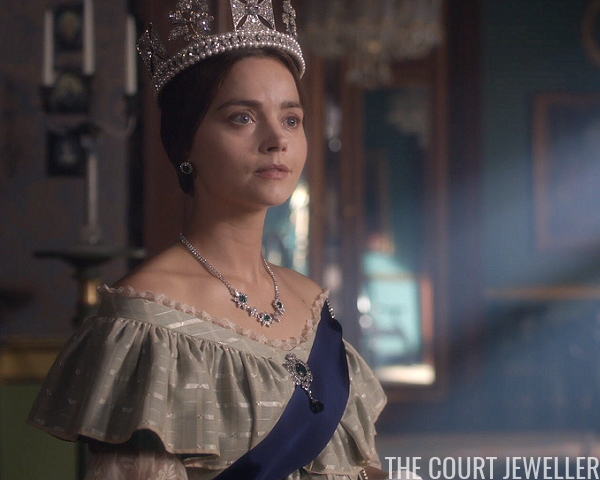 Too bad they didn't just replicate the actual suite of jewels that goes along with that tiara -- especially as they're on view at Kensington Palace right now for all to see! 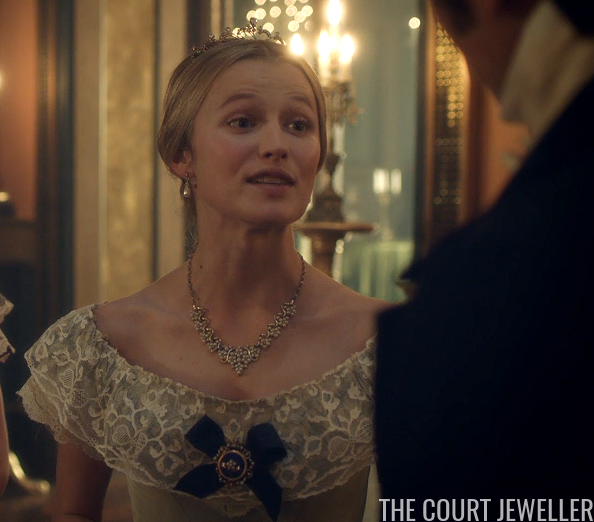 Anyway, back to the diadem: it makes an appearance on one more character in the episode, little Princess Vicky. Little Prince Bertie refuses to try it on, saying that "crowns are for girls." 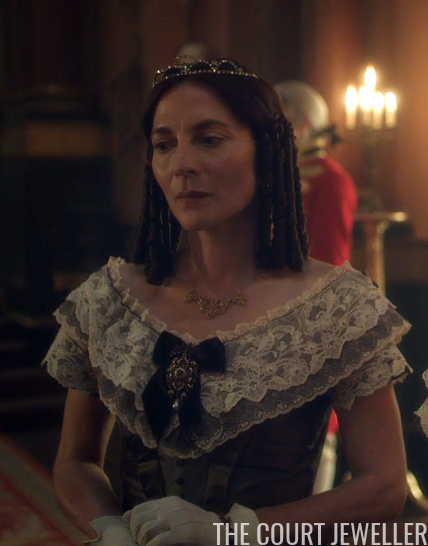 The show does seem to be sort of depicting real life here -- Bertie apparently thought for years that his sister was going to be the monarch, not him. We also got a bit of daytime jewelry, all production-invented. 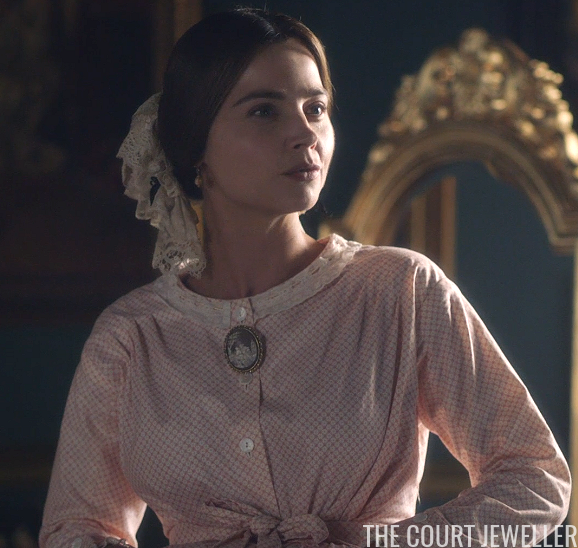 This cameo brooch featured in multiple scenes. 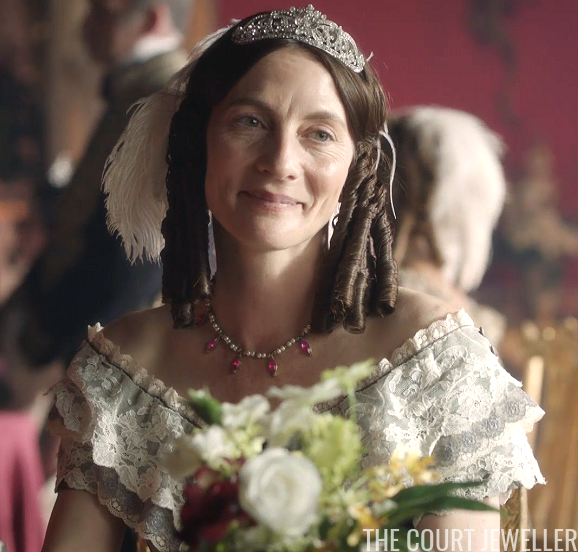 This delicate little leaf brooch also made a lengthy appearance. And we also saw this silvery little oval brooch with what appears to be filigree-style detail. ...and an opalescent day brooch on Sophie Monmouth. 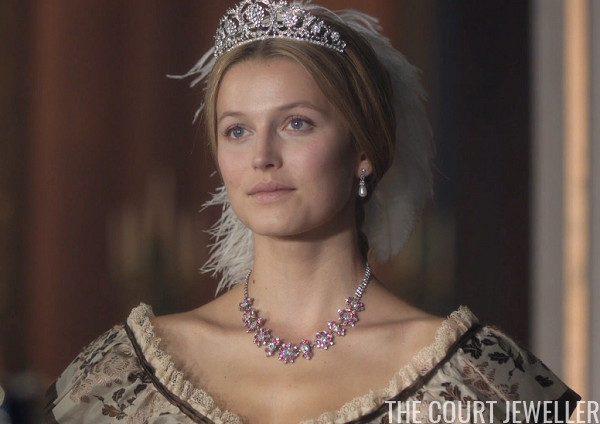 The episode also features tiaras and jewels for a reception held in honor of King Louis-Philippe. 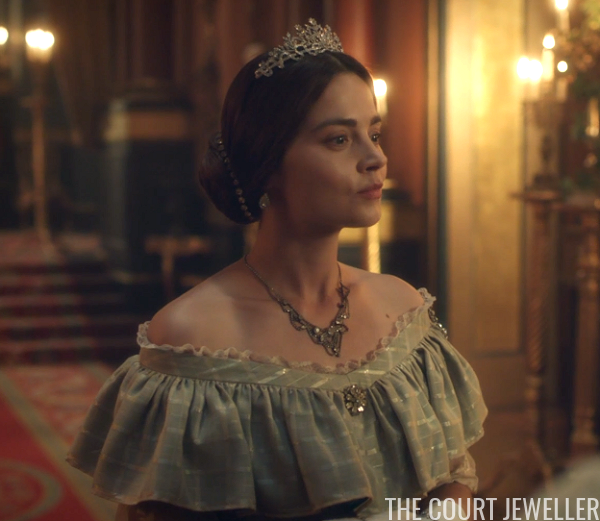 Victoria wears all production-invented jewels here, including a tiara, necklace, brooch, and another necklace in her hair. ...as well as these on Sophie Monmouth. 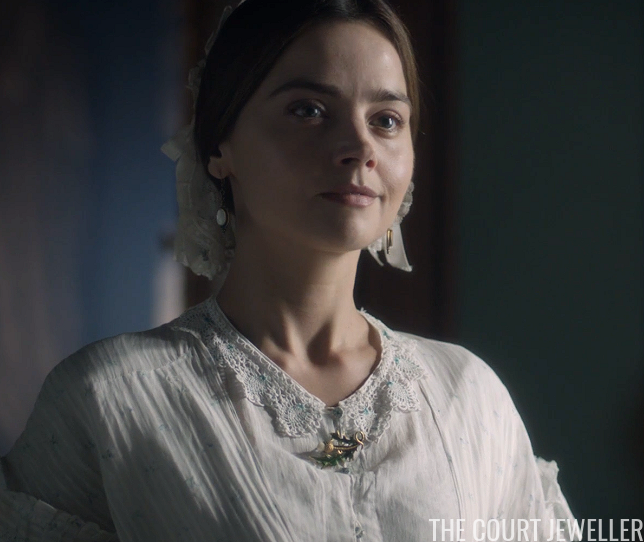 The jewels aren't impressive, but there is at least a little continuity here: Sophie explains that her brooch was a gift from the Queen, and it was indeed worn by Victoria last season. One more little bit of reception jewelry from the episode: this is Princess Feodora, who is presented in the show as a sinister stranger. 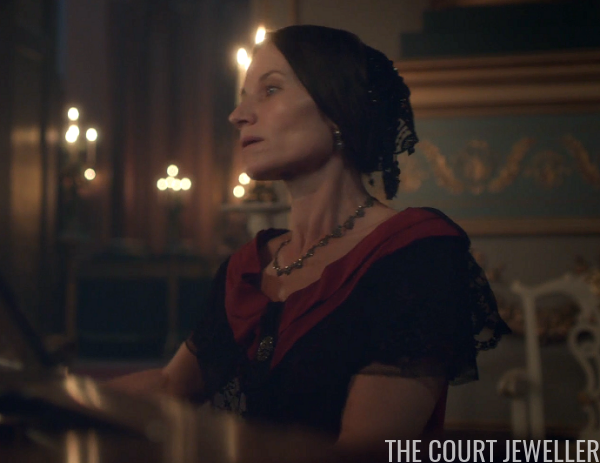 She wears a non-descript necklace and brooch to play the piano for the deposed French king. That's it until next week! Did you watch the show? 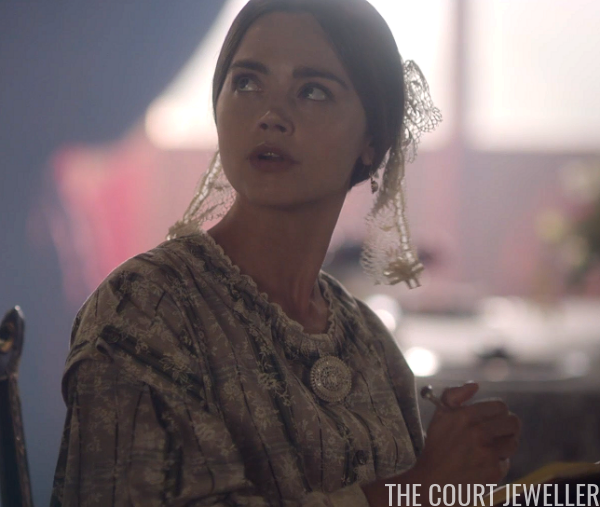 What did you make of the episode (and the jewels)?